It has been three months since the loss of Daniel Jackson. O'Neill has resisted nine unsuccessful attempts to replace him, as well as pressure to add a Russian to the team. Since settling on Earth from Kelowna, Jonas Quinn has dedicated himself to mastering Daniel's work, and he is anxious to prove himself to O'Neill and to continue Daniel's work as a member of SG-1. The naquadria which Jonas brought with him from Kelowna has been used to create the first human-built spacecraft capable of achieving hyperspace for interstellar travel, and now the prototype X-302 is ready to be revealed. Bra'tac arrives at the SGC bringing the sad news that Teal'c's wife, Drey'auc, is seriously ill. Teal'c returns with him to the base of the Rebel Jaffa, but arrives to find that Drey'auc has died, and a bitter Rya'c blames his father for her death. A second incoming wormhole activates at the SGC, but this time there is no incoming traveler, and the gate cannot be shut down. Carter determines that small amounts of energy are being transmitted through the open gate causing an energy buildup that will overload the stargate and result in an explosion capable of destroying all life on Earth. Word reaches Bra'tac and Teal'c that Anubis has discovered an ancient device that can use one stargate to destroy another, and Earth is his target. With the stargate inaccessible, Earth's only hope is to contact off-world allies for help using the only means of interstellar communication remaining to them, the prototype X-302. O'Neill and Carter pilot the craft, but the instability of the naquadria triggers a built-in safety feature, forcing the ship to auto-abort and return to Earth. With Earth facing annihilation, a holographic image of Anubis appears in the gateroom, warning the Tauri to prepare to meet their doom. With 54 hours before Earth's destruction at the hands of Anubis, Dr. McKay suggests a desperate plan. An electromagnetic pulse sent back through the stargate should destroy the source of the energy buildup that threatens the gate. However, as Carter feared, when the plan is implemented, the energy feedback causes a power surge that destroys the generator and cuts Earth's remaining time in half. Meanwhile, Bra'tac and Teal'c determine the origin of the wormhole connected to Earth, and with Rya'c they arrive by ship at Anubis's planet. There they find technology of alien design sending a beam of energy through the stargate. Anubis's alien weapon is under heavy guard by his loyal Jaffa, and Bra'tac, Teal'c and Rya'c come under attack. Rya'c is wounded and ordered to stay behind, and Bra'tac and Teal'c are captured. In the gateroom on Earth, Jonas considers how the stargate was lowered into the facility, which leads to the idea that the gate can be removed and jettisoned from Earth before it explodes. The gate is attached to the X-302, and O'Neill pilots the craft toward space, but a malfunction sends him plummeting back toward Earth. O'Neill risks using the naquadria-powered hyperdrive once more, and this time the hyperspace window activates. Just as the X-302 enters hyperspace, O'Neill ejects, leaving the stargate to detonate safely over three million miles away. Meanwhile, Rya'c steals a death glider and destroys Anubis's weapon from the air. Earth has been saved, but the SGC must be shut down until Teal'c sends word that Anubis's weapon is no longer a threat. 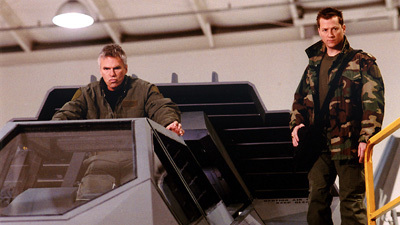 The second stargate is negotiated from the Russians in exchange for technology and a Russian presence at the SGC, but the presence will not be on SG-1. O'Neill makes the decision to acknowledge Jonas's contributions in saving Earth from destruction by welcoming him to the fourth position on SG-1. This episode aired in two parts. Captain Hagman was the ninth trial replacement for Daniel Jackson, until the mission to P2X-374 when he misinterpreted communication and the team barely escaped an attack by primitive natives with spears and tranquilizer darts. O’Neill suffered a paritally torn ligament in the right knee during the attack. It has been three months since Jonas arrived on Earth. He has the ability to learn much quicker than the average human, and has committed to memory almost all of Daniel Jackson’s work. Anubis has a weapon that uses one stargate to destroy another by transmitting barely detectable amounts of energy through the gate, causing a rise in power to be retained by the gate’s internal capacitors. If the gate’s capacity for absorbing energy is exceeded, the naquadah of which it is made will become charged and could eventually explode in a blast of 2000 to 3000 megatons, enough to take out Colorado with resulting environmental effects severe enough to destroy all life on Earth. The X-302 was designed to be the first human-built spacecraft capable of interstellar travel. It has four different sets of engines: air-breathing jets, modified aerospikes for high altitudes, a rocket booster, and a naquadria-powered hyperspace window generator. Due to the inability to compensate for the energy fluctuations emitted by the unstable naquadria, the X-302 could not get a lock on its destination when the hyperspace window opened, causing a 605-3 error in which the autopilot engaged and the mission auto-aborted. The instability of naquadria increases exponentially as you attempt to extract more energy from it. In order to keep a wormhole open, something, such as an object, radio signal, or energy, must be sent through. Normally the gate shuts down automatically after a short period of time if nothing is entering the event horizon from the outgoing location. Wormholes draw their energy from the outgoing source. A wormhole cannot be established with a stargate that is already active. Death gliders are not capable of entering hyperspace because they are too small to carry the Goa’uld version of the hyperspace window generator. O’Neill and Carter have been trained as pilots, and fly the X-302. Drey’auc was a Jaffa. She refused to accept a new symbiote to save her life, and died at the Rebel Jaffa outpost. Anubis’s weapon appears to be stolen technology and was probably built by the Ancients. The ceiling of the gateroom retracts. The shaft above it leads to the surface, with a crane mechanism that allows the gate to be hoisted into or out of the gateroom. The SGC stargate was removed, transported by the X-302, and detonated in space 3 million miles from Earth, leaving only one stargate on Earth. The Russian gate was installed at the SGC in exchange for an undisclosed amount of money, the plans for the X-302 and X-303, and a promise of a Russian officer to join SG-1. The stargate weighs 64,000 pounds.